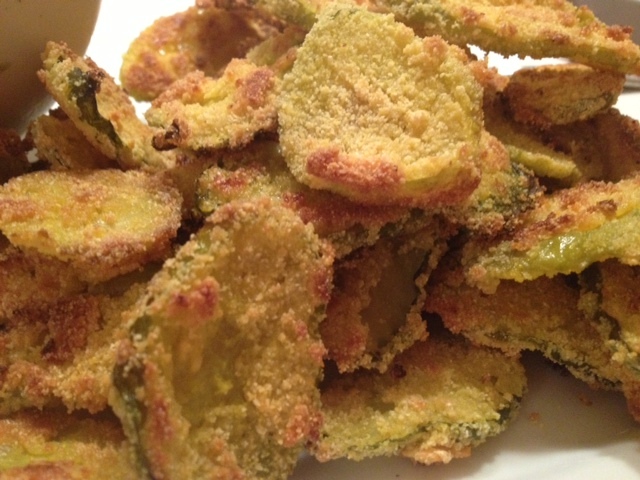 New & Improved Baked “Fried” Pickles. 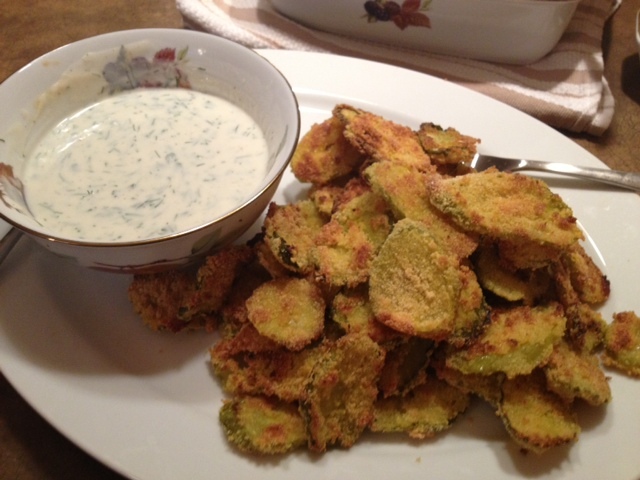 New & Improved Gluten-Free, Baked “Fried” Pickles With Low-Fat Herbed Buttermilk Ranch Dressing. I had friends over to our new house this past weekend and I wanted to make more of my baked “fried” pickles for everybody to try. I made a few small tweaks to the original recipe that I posted a few weeks back and these small changes made a huge difference! These pickles are even crunchier and even tastier than the others! I served them with an herbed, low-fat buttermilk ranch dressing which went perfectly with the pickles. These were a BIG hit with my friends. They were eaten up very quickly, which is always a good sign! Drain the dill pickles and use a paper towel to dab off any excess liquid. In a bowl, combine the corn meal, gluten-free bread crumbs, onion powder and garlic powder. Mix the ingredients up with a fork. In a small bowl, whisk your eggs. Take half of the pickles and dip them into the eggs, then place them into the breading mixture, coating both sides. 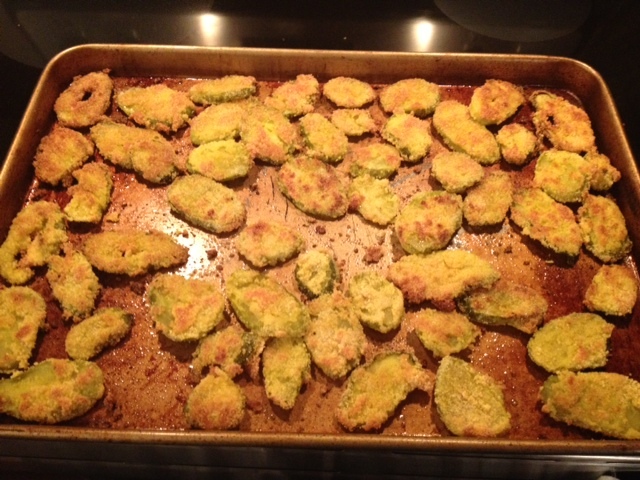 Put the breaded pickles on a plate and set aside. Repeat with the remainder of the pickles. Coat a large non-stick baking sheet with 4-5 tbsp of olive oil (enough so that the whole pan has a generous coating) and put the baking sheet into a 400 degree oven for about 3-4 minutes to heat the oil. Remove the hot baking sheet from the oven and line up the pickles evenly on the sheet. Season with a light dash of garlic salt. Put the baking sheet back into the oven. After 15 minutes, remove them from the oven and flip the pickles to cook the other side for an additional 15 minutes. If the pickles seem a bit dry, you can always add a little bit more olive oil to the pan. While the pickles are in the oven, mix together the low-fat sour cream, reduced-fat mayonnaise, buttermilk, dill, parsley, onion powder, garlic powder, lemon juice, pepper and salt and mix well. When the pickles come out of the oven, serve them with the herbed ranch dressing. ← Stewed Orka & Cheesy Quinoa.